FAWLTY FARM offers a unique farm-stay experience with a range of accommodation options including the romantic Lake House, cosy old pool room, cute A frames and practical bunkhouses. Relax with family and friends under The Big Top and enjoy the open fire pit, extensive outdoor cooking options and the largest 12 person cedar Hot Tub in Australia. Splash around in our PRIVATE lake where you can fish, paddle boat, kayak and swim. The lake is stocked with fish and is safe for swimming but is not fenced. Take a nature walk and enjoy the local fauna such as kangaroos, wombats and echidnas. BYO boat for fun on Lake Eildon. We have the largest pontoon in Taylor Bay which has 2 X 9m sides that will accommodate your super boats. There is no charge for guests. - a visit to our operational quartz reef Gold Mine. It's been running for 80 years and some guests still find gold!! - a trip in our 20 person ex-army Land Rover to our private Ridge Hut for a Sundowner. Sparkling wine, cheese and nibbles provided. The whole environment of FAWLTY FARM is perfect for large groups of family/friends looking for a place with great facilities and unique accommodation. Situated on 300 acres of steeply undulating country with a mixture of open grassy paddocks and dense natural bush-land, FAWLTY FARM is a perfect country getaway where the only sounds you will hear is the abundant wildlife and the laughter of family and friends. 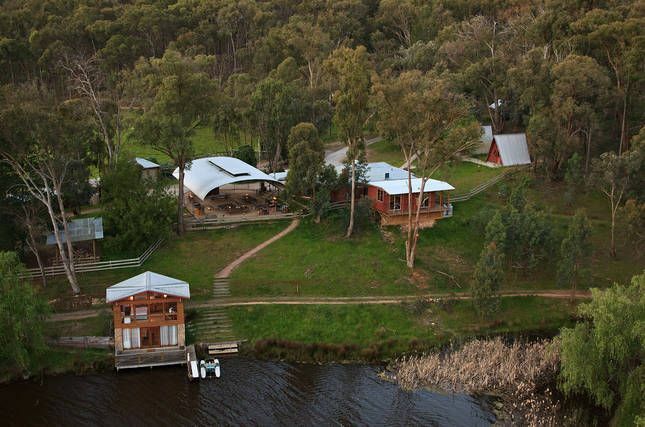 Other activities in the surrounding area include bushwalking, mountain bike riding, fishing and horse riding. Please ask us for information on these activities. There is plenty of room for your cars, boats, caravans and horses. Please enquire first if you would like to bring any pets, as generally, it is not a suitable environment for dogs. BYO sheets and towels. Other bedding such as pillows, doonas and blankets are supplied. Taylor Bay is unique as access to Lake Eildon is only possible through private land. There are no public facilities in Taylor Bay making the area safe, secluded and exclusive. The small but delightful township of Eildon is only 7 minutes away and the Dam Wall has year round boat launching. The lake is currently at about 75 percent capacity which is more than 3 times the size of Sydney Harbour. John and Sally have been welcoming guests to FAWLTY FARM for more than 30 years. The property is 'Hosted Accommodation' which means we reside on the property but in a separate dwelling. We are here to help and assist but won't get in the way of your group enjoying everything FAWLTY FARM has to offer. - half 44 gallon drum Charcoal Cooker which is great for all cuts of meat. BYO food and drinks. You will need to do your own cooking and cleaning with a view to leaving the premises as they were found i.e. clean please. Connected to The Big Top is a large building that houses a substantial indoor kitchen and living room, as well as the bathroom complex with 2 toilets and 2 showers.A second bathroom has another toilet as well as a shower over bath and a double handbasin cabinet. There is also a Poolroom with a wall plasma, soccer table and reverse A/C. The bunkhouse is 2 rooms with 6 bunks in each. There are four separate cosy A frame cabins each with a double bed and two folding camp beds. The romantic Lake House is a separate 2 storey dwelling on our private lake. It has a queen size bed and a slipper bath/shower upstairs. Downstairs is a double and single bed, kitchenette, toilet and TV. Large double doors open onto a deck over the lake with a 10 person dining setting and BBQ. Awesome in summer. OVERALL - FAWLTY FARM has a total of 5 double beds and two Queens, 15 singles and 8 folding beds suitable for children 4-10 years. The whole facility can accommodate 29 adults and 8 children under 10. However, current regulations stipulate the maximum number of adults allowed to be accommodated as paying guests is 18. Obviously our housing facilities are greater than this. Cost depends on a number of factors such as number of adults, length of stay, days of the week, month of the year and number of days before arrival. Please use the Stayz calculator to determine cost prior to enquiring. That said, there is the old supply/demand factor meaning we may be negotiable on price if we need your booking i.e. the Bums on Seats factor. FROM January 2018, children 10-16 are half price at $45 per child per night. Children under 5 are FREE. The nightly rate is based on 13 adults with extra adults $95 per person per night. Generally, long weekends and some holiday prices vary but as a rule of thumb, the cost per adult is usually around $100 per person per night based on 13 adults. We hope to welcome you to FAWLTY FARM soon. Absolutely out of this world incredible! John has created possibly the most special place I’ve ever had the privaledge of staying at. We visited with a large group for my 30th, and whether it’s the beautiful private lake with waterfront bedrooms, the A- frame chalet tiny houses, the bonkers view from the hut at the top of the hill on the property, the personal boat trip on lake Eildon- John’s pad really has everything. John was the perfect host, always nearby if we needed or with the next incredible experience lined up. John’s magical place is only overshadowed by his heartfelt hospitality and warmth. Some of our group even dubbed it ‘their favourite weekend of their lives’! Don’t be a stranger John, we’ll definitely be coming back soon ;) thanks again for making my 30th unforgettable! This was our first time to fawlty farm and it was amazing. We absolutely loved the property, with heaps of things to do we were always entertained. Our favourite was the diving board into the lake! John goes out of his way to assist when needed and has thought of everything to make the stay great. We can't thank you enough john for having us and we will defiantly be coming back for another great holiday. WOW. Fawlty farm (And the whole entire drive there) is absolutely amazing. You will be stunned by all the views. Perfect for a large group get away. The hosts John and Sally only made it 10 times better. They both ensured we were happy the entire stay by trying to satisfy our every need. Highly recomend to try all 3 activities. Kids enjoyed every second of it. We will definitely be back John! Thank you so much for all your effort and a much memorable stay. Blown away with your lovely comments, Annita. This is where the little sign by the front door that says " Enter as strangers, leave as Friends" rings true. We both remarked at the sense of loss when you all drove away on Sunday. Please do return one day. Fawlty Farm is a little hidden gem. The minute we walked in we were blown away with the breathtaking views! John & Sally welcome you with open arms and were an absolute pleasure the whole weekend. The facilities were great, the kitchen fully equipped with everything you could think of. The outdoor entertaining area is fantastic, the fire pit, the pizza oven & the spit were all a highlight. The best thing and an absolute must-do if you visit Fawlty Farm is the boat & hut tour. Both of which were absolutely incredible. We regretfully didn't do the mining tour. There isn't one thing John and Sally haven't thought of when it comes to Fawlty Farm. We already can't wait for our next visit. Thanks so much for having us. This great fun group were exciting to be with. Most prepared to brave a swin in the beautiful clear refreshing deep waters of Lake Eildon. Highlight for us was Alex's perfect execution of sabrage at his first attempt. Great photos for his 30th birhtday.Very welcome for a return visit. The property has everything you could want and more . over Eildon .It was truly magical. Oh Caroline, you are too kind. It was truly a pleasure to be with you and your family and friends. Great mix of everything. Thoroughly enjoyed our stay. Lots of wonderful memories taken away with us. Children enjoyed themselves immensely. Highly recommend for big family groups.